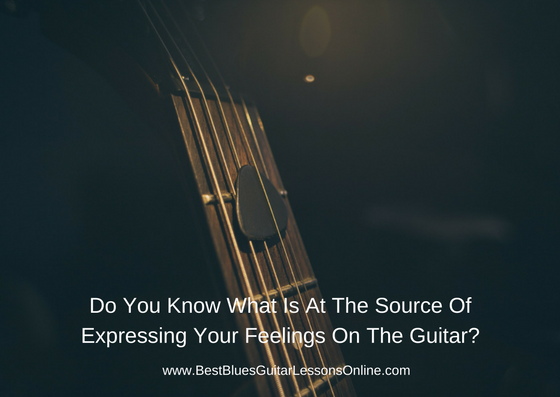 Do you know what is at the source of expressing your feelings on the guitar? This article will lead you to develop a highly expressive level of improvising by showing the possibilities of how you can train your picking hand in order to alter dynamics and tone every time you play blues solos as well as rhythm parts. This will lead to heightened self-expressiveness while you are soloing. When we are talking about mastering guitar phrasing we are not talking about WHAT you play but HOW you play. Think about when you would listen to a speaker giving a speech and every word you hear is at the exact same volume, without any emphasis on certain important words or sentences. The speech would lose all its cogency and consequently the message would get lost. So a crucial first step in mastering guitar phasing is in mastering dynamics and tone. By playing without pick but instead using the fingers you can add various types of dynamics that wouldn’t be otherwise possible. A great exercise is to repeat the exact same licks or solos multiple times, but change the dynamics and tone of each by using the picking hand only. The next exercises will help you build up a more mature sound in your improvised guitar solos. When playing without a guitar pick, most things will automatically tend to sound ‘softer’ than when playing with a pick. A great way of discovering this playing style is by strumming with the side of your thumb. The side of the thumb gives a kind of damped sound that creates a modest feel in your guitar playing. You don’t necessarily need to play very quiet to create a modest feel, the side of the thumb is soft and will contribute to a more introvert feeling to whatever you play. Do you hear the difference in dynamics and tonal qualities when you compare playing with the thumb to playing with the guitar pick? Bluesjazz guitarists like Kenny Burell often play melodies with their thumb to make these melodies stand out dynamically in contrast to the solos. Now try to improvise over a backing track without a pick, only using the side of your picking hand thumb. It isn’t only soft playing that is possible when playing without a pick, aggressive playing can be done as well. In this style of playing the only difference is the direction of how you pull the strings. Normally when the strings are strummed or picked, the movement of our pick or fingers is going either up towards the ceiling or down towards the floor. When playing aggressively without a pick, we are pulling the string away from the body of the guitar causing the string to ‘spank’ the frets, creating a punching aggressive accent to the notes played. You can do this with all fingers but the strongest fingers (thumb, index- and middle finger) will give the best result. I would recommend this for single notes or double stops rather than for chords. Take a 12 bar blues backing track but before you start playing divide the bars in aggressive moments and soft/mellow moments, thus creating a huge contrast of dynamics. Try to make as much difference as you can between the soft and hard parts. When playing with the guitar pick, its important to know what pick you will use. Once you start to get the idea of playing dynamically with the right hand, it will soon become clear that the thickness of the guitar pick makes a great difference. Playing expressively aggressive with a soft pick won’t be easy, in fact, if too soft, almost impossible. Nevertheless the opposite isn’t true; with a hard pick you can play both aggressive as well as soft. So the key is to find a hard pick and learn how to play soft with it by holding it gently. Then you should learn to make the dynamics change by holding the guitar pick tighter and ‘highlighting’ the phrases you want to express at the time. To play softly and shy you need to find the right pressure to hold the pick. If you grab the pick too tight almost everything you play will sound rough. So the key is to gently hold the pick - just tight enough - so it won’t fall out of your hand while playing. Also experiment with the angle in which you approach the string with the pick as you will sound less direct if you hit the string in an angle instead of hitting it perpendicular to the string. While playing aggressive, the use of a hard pick comes into play. You can really hit the strings hard when trying to make one note sound aggressive, but it is of great importance that the fretting hand is muting all the strings that should not be heard correctly. In that manner you can ‘go wild’ with the right hand, strumming all strings while you only hear the notes you fret. You can see a good example of this in my video on how to play like Stevie Ray Vaughan. The challenge now is to improvise while creating as much contrast possible and combining these techniques described above. Try to repeat improvised guitar licks while you are soloing while clearly making the difference in hard and soft playing. Hybrid picking is a great technique that can create lots of dynamics in your playing. Although this technique takes quite an amount of skill, it is most certainly worth mastering. When using hybrid picking it is possible to take the picking styles mentioned above and combine them. When using this technique, we are holding the pick between the thumb and index finger as usual and are using the middle- and ring finger to pluck the strings. This technique can bring a greater variety in your guitar playing, giving you more options in the area of dynamics and tone, not to mention that it facilitates wide string skips. Take the first four bars to play softly with the fingers. The next two bars on the IV chord, play slightly more aggressive with only the fingers. Then on the IV and V chord, give everything you got -aggressively- with the pick. Then finish the last two bars with hybrid picking. After reading this article I would recommend studying my free emotional guitar soloing guide where you will learn exactly how you can respond emotionally to what you hear when improvising. Is your blues guitar soloing progress stuck in a rut? Learn how to get out of the soloing cage you are in in this Essential Lesson On Blues Guitar Soloing.